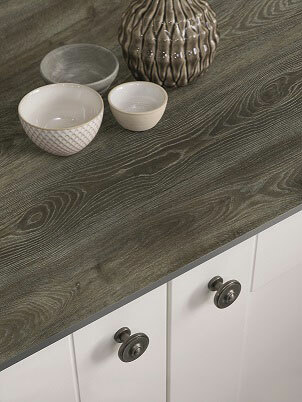 Laminate worktops have long been the default choice of customers wanting a durable finish at a reasonable price, but Kitchen design is changing and our expectations are greater, so rather than saying farewell to Laminate worktops, say Hello and welcome to EVOLVE from Bushboard. 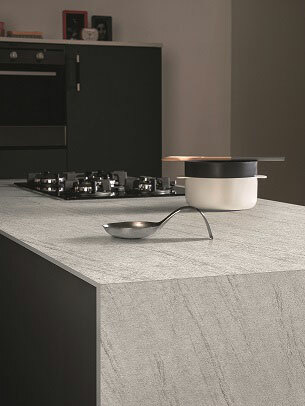 Traditional laminate worktops are made of chipboard covered with a laminate veneer approximately 0.6mm thick. EVOLVE does away with the chipboard altogether and simply makes the laminate thicker, in fact 12.5mm thick! It sounds easy, but we all know that just by making the laminate thicker, it is not going to make it into a desirable worksurface. Bushboard has selected a combination of decors, coloured core papers and textures that work together to make a product that is not only desirable, but practical, durable and easy to clean. 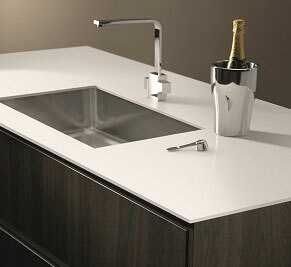 EVOLVE worktops are 100% waterproof so they can be used with any style of sink. EVOLVE worktops come in a choice of 15 designs with 3 size options. Find out more on our dedicated EVOLVE page.